James is the Counsellor with The Lion Mind. He has many years of experiences working with people from all walks of life (e.g. addiction, elderly, renal health, students, working professionals). As a strong believer of using evidence-based treatment, his counselling approaches include Cognitive Behaviour Therapy, and Solution-Focused Brief Therapy. He is also proficient in providing career counselling, group counselling, psychiatric rehabilitation counselling, and in providing the 5Es of renal rehabilitation. James has presented in 2 oral presentations during the 5th Asia Pacific Rim International Psychotherapy and Counselling Conference 2017 in Singapore, and has published a peer-reviewed paper in the Australia Counselling Association (ACA)’s Counselling Australia Magazine. 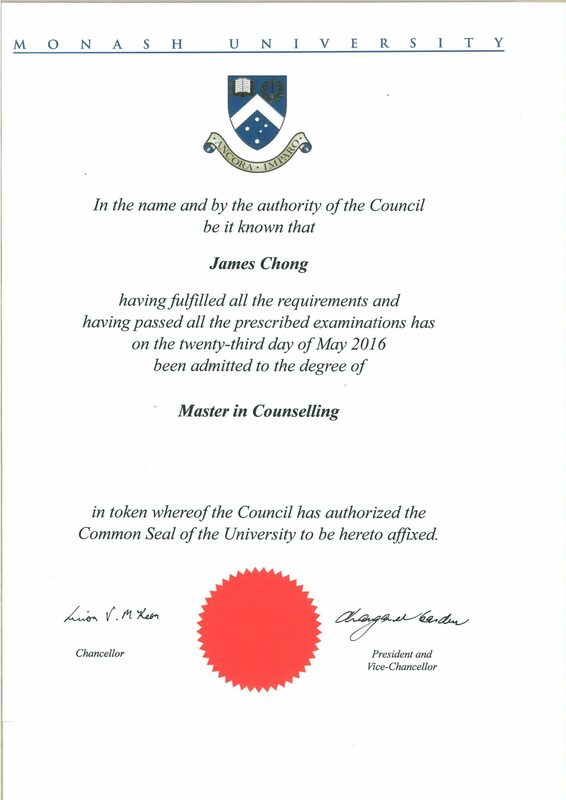 James is a strong believer in continuous education and life-long learning. To date, he has a Master in Counselling from Monash University, and a Bachelor of Arts (Psychology) from the National University of Singapore (NUS). His other professional qualifications include Professional Diploma in Psychotherapy from the School of Positive Psychology, and Specialist Diploma in Career Counselling from Republic Polytechnic. 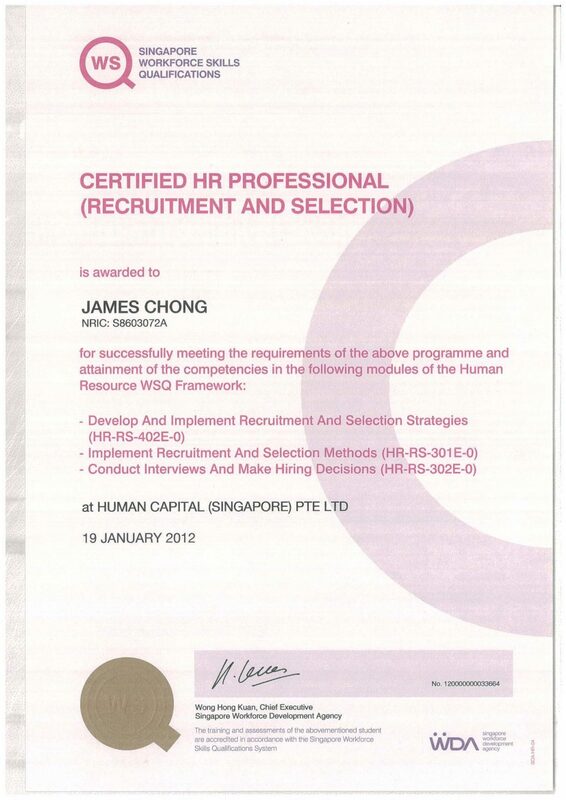 He is also a WSQ certified HR Professional (Recruitment & Selection), and a certified Advanced Care Planning (ACP) Facilitator. 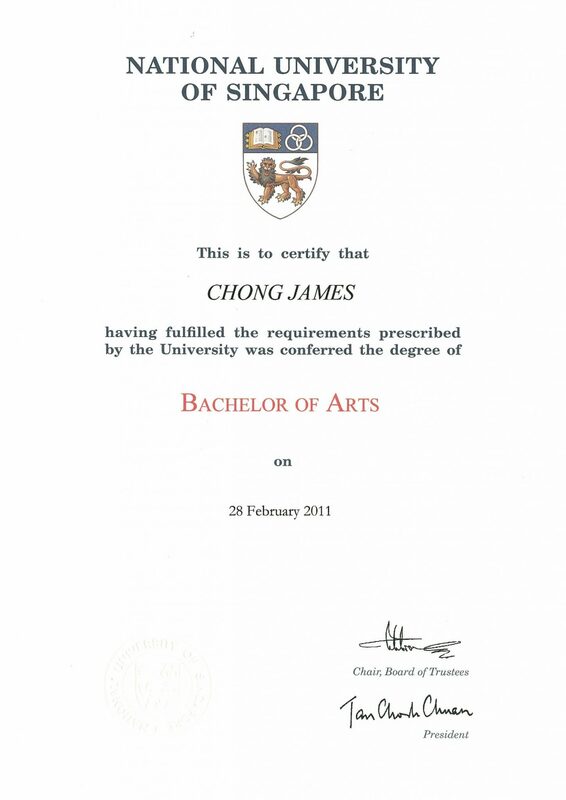 In addition, James is currently a graduate student for the Master of Arts (Applied Psychology) programme with the Nanyang Technological University (NTU). 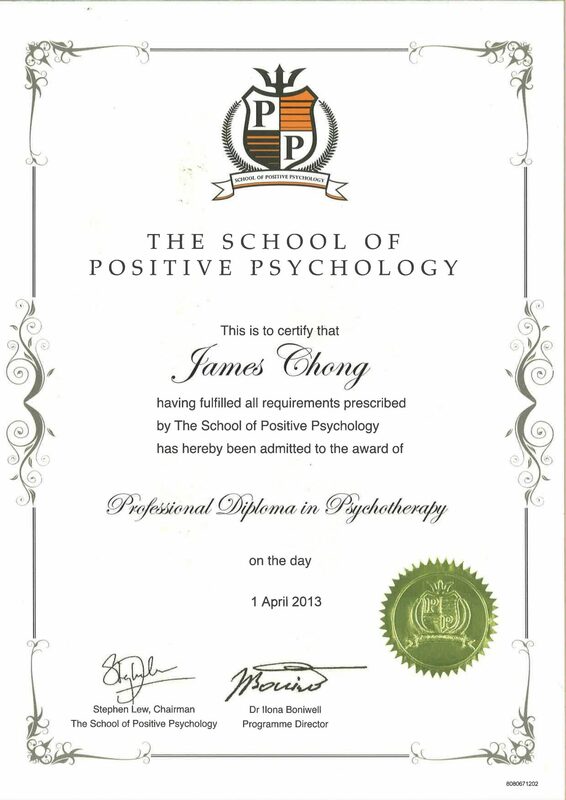 James is a registered Level 2 Practitioner (membership no. 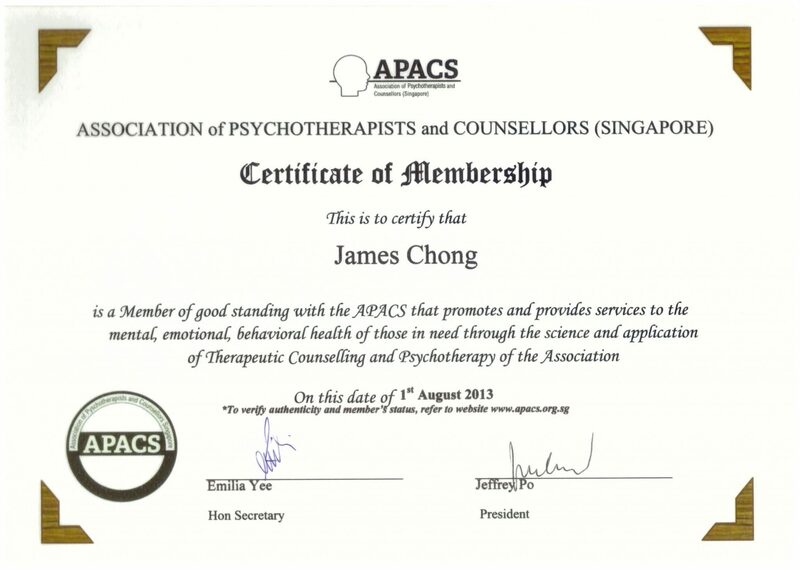 A0084) with the Association of Psychotherapists and Counsellors Singapore (APACS), and an Affiliate member with the Australian Psychological Society (APS) since 2013. He is also a Full Member (membership no. 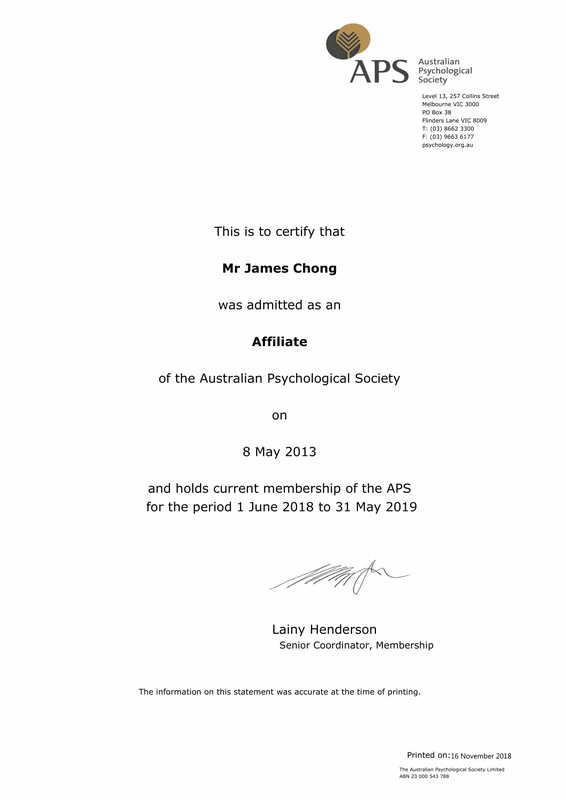 FM019005C) with the Singapore Psychological Society (SPS) since 2019. Yap Weiren is the Operations-In-Charge with The Lion Mind. He oversees the operational aspects of the organisation, ensuring smooth operations in the organisation. He has extensive working experience in both logistics and business operations. In addition, Weiren is the Chairman of Appassionata Limited. He is committed to bringing chamber classical music to the masses through partnering with established musicians. He also aims to help provide the necessary platform for both aspiring and professional musicians to showcase their talents in Singapore. He has a Bachelor of Business Management from NHL University of Applied Sciences Netherlands, Maritime Institute Willem Barentsz (Netherlands), and a Diploma in Maritime Transportation Management from Singapore Polytechnic. He has recently completed an accredited course (ACA, APACS) on Cognitive Behaviour Therapy. Weiren is also an Ordinary member (membership no. 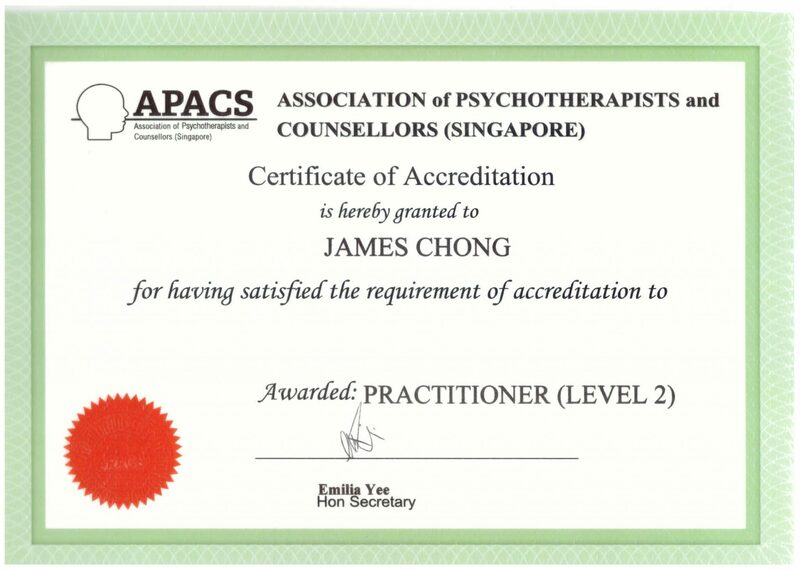 A219) with the Association of Psychotherapists and Counsellors Singapore (APACS). Tan Wei Jie is the Centre Manager with The Lion Mind. He oversees the operational aspects of the counselling centre, ensuring smooth centre operations. He has eight years of extensive working experiences in both instructional and operations in the Navy. He has a Diploma in Information Technology from Ngee Ann Polytechnic. He is currently an undergraduate student for the Bachelor of Arts (Psychology) programme with Murdoch University. Belinda is the Wellness Consultant with The Lion Mind. She is in-charge of working with corporate partners in destigmatising mental health. She has more than 10 years’ work experiences in both the finance and law industry. In addition, she is an active volunteer at All Saints Home and CARE Singapore. She has a Bachelor of Science (Hons) Mathematics & Management from King’s College, University of London, and a Graduate Diploma in Law from BPP University Law School (London). In addition, she has completed her training in Gottman Method Couples Therapy level 1. She is currently a graduate student for the Master of Counselling programme with Monash University. Tok Sheng is the Counsellor with The Lion Mind. He has several years of experiences working with adolescent, elderly, renal health, students, and working professionals. His counselling approaches includes Cognitive Behaviour Therapy, and Clinical Hypnotherapy. He is also proficient in Mental Health First Aid. 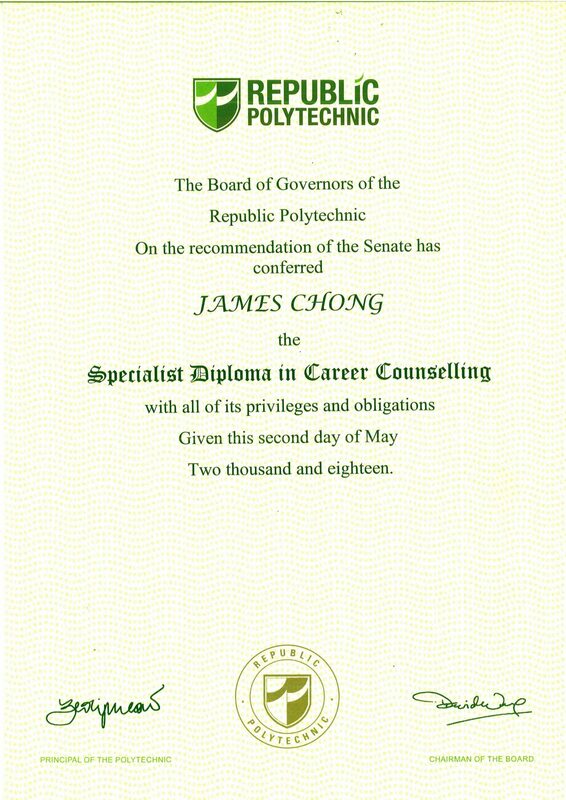 He has a Master of Counselling, and a Bachelor of Arts (Sociology & Behavioural Studies) from Monash University, and a Diploma in Media Studies & Management from Nanyang Polytechnic. In addition, he has a Professional Certificate in Adolescent Counselling, Certificate in Holistic Hypnotherapy (Master Practitioner), and Certificate of Accreditation on Mental Health First Aid (Australia). Dhivyaasrree is the Events-In-Charge with The Lion Mind. She oversees the smooth planning and execution of events for the organisation. She is an active member of Peer Mentors with SIM GE, providing peer support to students and facilitating camps and events. In addition, she is part of the Publication sub-committee of the SIM Psychology Society. She has a Diploma in Mass Communication from Republic Polytechnic. She has also recently completed an accredited course (ACA, APACS) on Cognitive Behaviour Therapy. She is currently an undergraduate student for the Bachelor of Psychological Science programme with the University of Wollongong. Vivien Lai is the Liaison-In-Charge with The Lion Mind. She oversees the industrial partnerships, fostering meaningful collaborations for the organisation. She has various experiences working and interacting with children, as well as youths. She is an active member of Peer Mentors with SIM GE, providing peer support to students and facilitating camps and events. In addition, she is part of the Marketing sub-committee of the SIM Psychology Society. She is an Appropriate Adult volunteer with the Movement for the Intellectually Disabled of Singapore (MINDS) for persons with intellectual disability (PWID). She is also an active volunteer at IMH, facilitating activities for patients in rehabilitation wards. She has a Diploma in Early Childhood Education (Teaching & Leadership) from Ngee Ann Polytechnic. She has also recently completed an accredited course (ACA, APACS) on Cognitive Behaviour Therapy. She is currently an undergraduate student for the Bachelor of Arts (Psychology) programme with University of Buffalo. 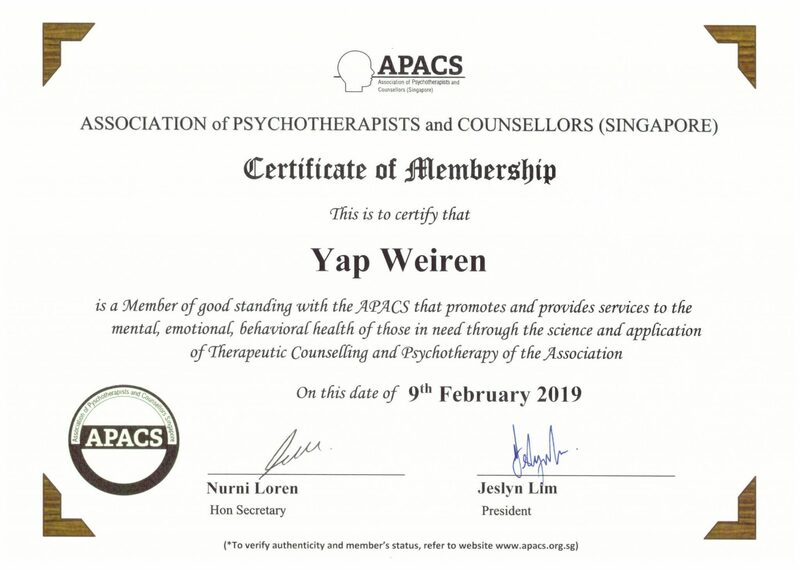 Vivien is also an Ordinary member with the Association of Psychotherapists and Counsellors Singapore (APACS), and a member of Psi Chi Honor Society. Eunice is Project Manager with The Lion Mind. With her many years of experiences in project management, she helps to support and to provide timely coordination for major projects, ensuring the success of these projects. She is a member of Peer Mentors in SIM GE, providing peer support to students and facilitating camps and events. In addition, she is an active volunteer at St. Andrews Autism Centre, as well as MINDS at Woodlands Garden School. She has a Diploma in Tourism and Resort Management from Ngee Ann Polytechnic. She is currently an undergraduate student for the Bachelor of Arts (Psychology) programme with University of Buffalo. She is also a member of Psi Chi Honor Society.